Following yet another extended gap in NASCAR Camping World Truck Series (NCWTS) competition, Justin Lofton, driver of the No. 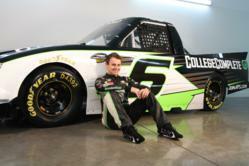 6 College Complete (http://www.collegecomplete.com or 877-543-2655) / Eddie Sharp Racing (ESR) Chevrolet, is looking forward to this week's race at the Charlotte Motor Speedway. "I am so glad that these breaks are about over," Lofton said, referencing the multiple off weeks peppered between the first five races. "It's always tough to start and stop, especially since we've been running so well. It's our job to keep the momentum on track going, no matter how much time goes by between races." Since the season kicked off in February, Lofton and the College Complete team have shown that they are a serious contender this season, having already scored two top-five and four top-10s in the first four races. The results have boosted Lofton to third in the driver point standings. The start to the 21-race schedule has been the strongest for the California racer, as he has already surpassed his 2011 top-five and top-10 count, as well as equaled his career-best finish of third during the season-opening race in Daytona. Added Lofton, "I feel like all of the pieces are fitting together this year. From the time we switched to Chevrolets last September, to our partnership with Richard Childress Racing (RCR) and Earnhardt-Childress Racing (ECR) engines, we have worked relentlessly to make sure we take advantage of the opportunity. All of the hard work is paying off." This Friday's race, the North Carolina Education Lottery 200, will mark Lofton's third Truck Series start at the 1.5-mile Charlotte area track. In his previous two starts at CMS, he has a best finish of 13th, scored last May. As he looks to continue his impressive string of 2012 results and improve upon his position at Charlotte, Lofton and his Dan Bormann led race team will take the same truck that he raced during their last event in Kansas, chassis 060. The last time Lofton wheeled the truck on April 21st, he qualified third and finished seventh. With two practice sessions, qualifying, and the race all scheduled for Friday, the activities kick off early at CMS with the first practice set to begin at 9 AM. Fans interested in meeting the College Complete driver before Friday's race can meet him on Thursday, May 17th at the Camping World store in Statesville, N.C. during their annual Grill Fest, running from 11 AM to 1 PM. Additionally, Lofton's sponsor, College Complete, will give away $1,000 if Lofton places within the top three in the North Carolina Education Lottery 200. "We are so proud of the support that we have received from the NASCAR community." said Dan Haim, CEO of CollegeComplete.com. "It is their support that keeps us going and allows us to provide Free Education Advice to all who request it." By going to http://www.CollegeComplete.com/contest, Contest fans can register for the contest as well as sign up to follow Lofton and College Complete on Twitter (requirements for entry). If Lofton then finishes within the top three on Friday, one entrant will be chosen at random and they will receive $1,000. Log on to http://www.collegecomplete.com/contest for complete details.